It has been estimated statistically that 20% of employees of a company tend to develop health problems related to work activities. Back pain: Especially pain in the neck, waist and shoulders. Commonly it is generated by a bad position and / or many hours of sitting during the workday. Stress: Usually reflected by a headache or migraine. Corresponds to the main cause of work absences. Visual fatigue: Affects on the eyes through burning, fatigue and / or red coloration. It occurs due to exposure to computers without protection, poor lighting or continuous reading. Carpal tunnel syndrome: Loss of force in the hands generated by repeated inflections of the wrist, commonly caused by the use of the computer. Chronic fatigue syndrome: Tiredness / prolonged exhaustion that can not be recovered with rest. It can reflect a variety of symptoms such as muscular discomfort, insomnia, fever, demotivation, laziness, loss of feeling of competence or work self-esteem, among others. A mechanism that helps prevent the onset of these diseases is the implementation of active breaks in companies. Active breaks are small moments of time during the workday where employees are removed from their daily routine to perform specific exercises that allow them to reactivate their mind and body by preventing the onset of certain occupational diseases. These active breaks can be performed at any time, mainly when feeling any discomfort of muscular type. It is recommended to perform at least one or two sessions during the working day. 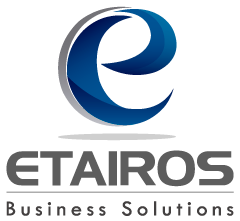 In Etairos we have implemented daily active pause sessions led by the area in charge of the Occupational Health and Safety Management System SG-SST. Initially, we started with a daily session in the middle of the working day of the afternoon with an approximate duration of 5 minutes, in which we tried to have the participation of all the company’s staff. These sessions are monitored and the people with the most participation in them are recognized. One of our pillars in Etairos and part of our mission is to have “happy collaborators”. In order to achieve this we must start by offering an adequate and pleasant environment to carry out their activities. 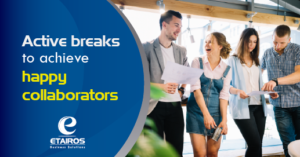 According to this our collaborators have ergonomic work places, we develop daily sessions of active breaks, and among other actions that allow us to achieve that goal that is a fundamental piece in the DNA of Etairos.